BaySail’s education programs give students anchoring phenomena to explore disciplinary core ideas and science and engineering practices aboard a tall ship or in the classroom using one of our world’s most precious resources. The Great Lakes are under heavy stress and we aim to guide students while supporting teachers through engaging activities to help foster environmental stewardship in our next generation of problem solvers. Our award-winning flagship program explores your watershed through environmental hands-on activities in science, technology, engineering and math (STEM) utilizing an inquiry-based approach in support of the current state and national science standards. Can accommodate up to 52 students utilizing both ships (schedule permitting). *Up to 50% scholarships may be available to local schools in Bay, Midland, Saginaw & Isabella counties! Plankton (D) – Use a plankton net to collect samples and later analyze plankton under a microscope while studying their role in the food web. Benthic (D) – Explore the benthic zone by taking a bottom sample with a petite ponar dredge and later search for and identify organisms that indicate water quality. Invasive Species (D) – Identify non-native species and explore their impact on the Great Lakes. Wetland/River Observation (B) – Use binoculars to observe wildlife and describe the basic functions of wetlands. Marine Debris (D) – Identify sources of debris, predict decomposition rates and discuss effects on aquatic life. Watershed (D) – Design a model to observe how the shape of the land determines surface water flow. Pollution Solutions (D) – Discuss water pollution sources and engineer and test solutions for an oil spill. Water Chemistry (U, D) – Collect a water sample with an alpha water bottle and later analyze samples for pH, dissolved oxygen, turbidity, nitrate and phosphate levels to determine water quality. 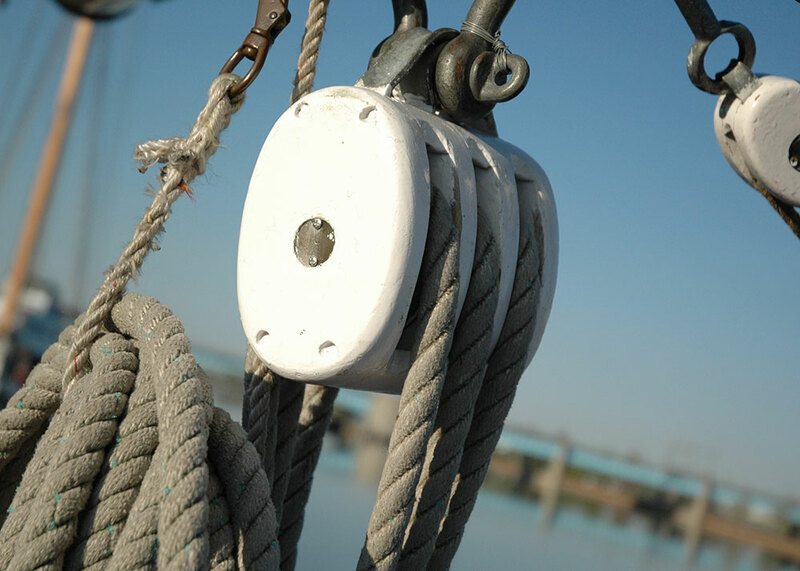 Knots (D) – Learn how to tie commonly used nautical knots and what each is used for. 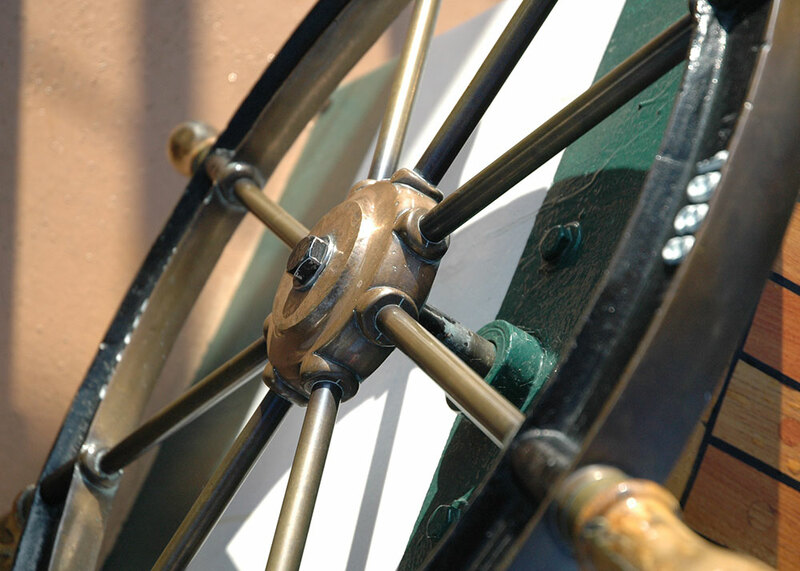 Navigation (D) – Learn about longitude and latitude and how to read a compass while investigating navigational charts and mapping your trip. Forces in Sailing (U, D) – Use vector and force concepts to solve equations as students explore how boats move. Discuss sailing angles that aid in propelling a sail boat forward. Buoyancy (D) – Explore buoyancy while competing in small groups to engineer small vessels designed to carry a load. Simple Machines (D) – Identify the six simple machines and their application to sailing and apply the mechanical advantage of a pulley when raising and/or trimming sail. Weather (D) – Interpret cloud structures and use electronic and historical devices to measure weather variables such as wind speed/direction, temperature and humidity. Food Web (D) – Explore the interconnected relationships within food webs. Drop in the Bucket (D) – Review sources of water on the earth, discuss how little freshwater is available for human use and propose ways to conserve this precious resource. Bioaccumulation (D) – An interactive food web model that introduces the concept of bioaccumulation. Saginaw River/Bay in a Jar (D) – students model different sources of water pollution then propose ways of reducing the impact of pollution in the area. Customizable to your area! (U) Designed for middle and high school students only. (B) Only available for Bay City departures. Geared towards younger students, our dockside programs include a series of stations similar to our Education Under Sail programs, yet modified for early childhood education. A dockside experience includes a tour of one of our schooners and an exploration of life aboard a tall ship. Plankton – Use a plankton net to collect samples and later analyze plankton under a microscope while studying their role in the food web. Benthic – Explore the benthic zone by taking a bottom sample with a petite ponar dredge and later search for and identify organisms that indicate water quality. Invasive Species – Identify non-native species and explore their impact on the Great Lakes. Marine Debris – Identify sources of debris, predict decomposition rates and discuss effects on aquatic life. Watershed – Design a model to observe how the shape of the land determines surface water flow. Pollution Solutions – Discuss water pollution sources and engineer and test solutions for an oil spill. Water Chemistry (U) – Collect a water sample with an alpha water bottle and later analyze samples for pH, dissolved oxygen, turbidity, nitrate and phosphate levels to determine water quality. Knots – Learn how to tie commonly used nautical knots and what each is used for. Navigation – Learn about longitude and latitude and how to read a compass while investigating navigational charts and mapping your trip. Forces in Sailing (U) – Use vector and force concepts to solve equations as students explore how boats move. Discuss sailing angles that aid in propelling a sail boat forward. Buoyancy – Explore buoyancy while competing in small groups to engineer small vessels designed to carry a load. Simple Machines – Identify the six simple machines and their application to sailing and apply the mechanical advantage of a pulley when raising and/or trimming sail. Weather – Interpret cloud structures and use electronic and historical devices to measure weather variables such as wind speed/direction, temperature and humidity. Food Web – Explore the interconnected relationships within food webs. Drop in the Bucket – Review sources of water on the earth, discuss how little freshwater is available for human use and propose ways to conserve this precious resource. Bioaccumulation – An interactive food web model that introduces the concept of bioaccumulation. Saginaw River/Bay in a Jar – students model different sources of water pollution then propose ways of reducing the impact of pollution in the area. Customizable to your area! Students explore their world in a truly place-based fashion utilizing the landscape to interpret human impacts on our watershed over time. Choose from multiple themes to customize an experience unlike anything that can be replicated in the classroom. 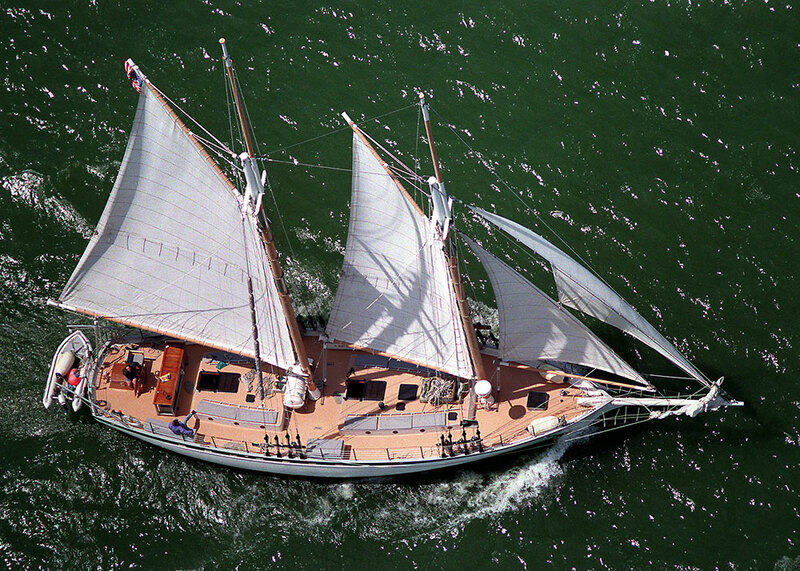 Sailing Into the Past— Traditional skills of a tall ship mariner are highlighted. 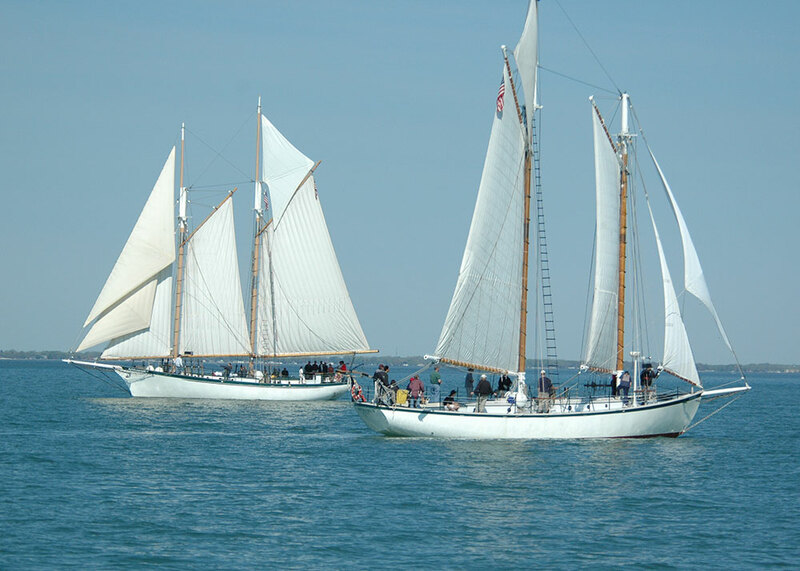 Explore knots, navigation and life aboard a Great Lakes schooner. Water Highways — Explore the important role that rivers have played in transportation and trade through activities that explore the tools and resources of the Fur Trade and Logging Eras as well as early and modern shipping practices. River Resources— Assign values to the resources offered by rivers by for wildlife, drinking water, transportation and more. Activities include observations of wildlife and their habitat, drinking water filtration and a look at past and present shipping maps. Current Contaminants—Learn about the current state of the Saginaw River and Saginaw Bay and how it came to be. Observe and discuss how the health of the river and bay impacts the economy, recreation, tourism, human health, environmental health and more. BaySail now has the ability to come to you! Programs can be delivered in the classroom, on school grounds, or at a nearby body of water. Choose from some of our default Science Under Sail modules or consult with our Education Department to customize a program that meets your needs. Approximately 30 students recommended per session. Marine Debris – Identify sources of marine debris, predict decomposition rates and discuss effects of debris on aquatic life. Watershed – Interact with a model to observe how the shape of the land determines surface water flow and how point and non-point source pollution contributes to water body health. Navigation –Learn about longitude and latitude and how to read a compass while investigating navigational charts and mapping your trip. Forces in Sailing (U) – Use vector and force concepts to solve equations as students explore how boats move and discuss sailing angles that aid in propelling a sail boat forward. Buoyancy –Explore buoyancy while competing in small groups to engineer miniature vessels designed to carry a load. Weather (program must include outdoor space & walking time) – Interpret cloud structures and use electronic and historical devices to measure weather variables such as wind speed/direction, temperature and humidity. Interested in our hands-on education programs outside of typical school hours? BaySail provides all of our place-based programming for other youth organizations too. Summer camps, scout groups and the like can take part in such exploration with special pricing options to accommodate smaller groups. Contact our Education Department for pricing and availability.